Recital with Yorgos Nousis’ works, 1st of April, Megaron Athens Concert Hall, in cooperation with Katerina Karioti. Upcoming recitals: 10th of November, “Mousiko Ergastiri” conservatory, Giannitsa, 8p.m. 30th of November and 1st of December, Tabya, Thessaloniki, 8p.m. Two Recitals, 29th and 30th of September, Music School of Ptolemaida and Museum of Kozani, 8p.m. New Album, available in August by DOBERMAN-YPPAN Productions. 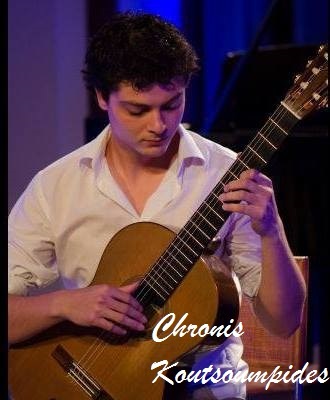 Recital, 30th of March, 27th Guitar Festival of Patra. Two Recitals, 24th and 25th of June, Casa dei Mezzo Music Festival, Makrigialos, Crete. Recital, 25th of May, 8:30pm, Antoniadios Stegi of Veria. A Tribute to Andres Segovia, 15th of May, 9pm, Megaron Music Hall Thessalonikis. Recital, 20th of November, 12pm, “Workshop of music”, Giannitsa. Pleased to announce my partnership with the Municipal Conservatory of Thermi and the Conservatory “Musical Workshop” of Giannitsa. Guitar Recital under the moonlight, 17th of August, 9 p.m,in the backyard of the municipal concervatory of Ptolemaida. Guitar and guitar-flute recital ( flute:Christina Tani ), 17/12/2015, “Tabya” Gallery, Thessaloniki. All proceeds will go to Social Despensary of Thessaloniki. Guitar and guitar-flute recital ( flute:Christina Tani ), 5/12/2015, Music Gymnasium of Ptolemaida. Next concert of the Aeolian Guitar Duo, 19/9/2015 in Salzburg, Hotel Hohenstauffen, at 6pm. Under the ” take-the-a-train” jazz festival.